India Video Surveillance Camera market (VSC) bagged a total unit shipment of 445,296 units for the CY Q2 2013; a decline of 13% as compared to the previous quarter shipments. CP PLUS leads the market followed by HIKVISION and MAXIMUS CCTV. According to 6Wresearch, India Video Surveillance Camera market recorded a total shipment of 445,296 units for the CY Q2 2013; a decline of 13% to the previous quarter shipments. CP PLUS leads the market followed by HIKVISION and MAXIMUS CCTV. CP PLUS with the market share of 27% replaced HIKVISION in CY Q2 2013. Moreover, CP PLUS experienced a growth of around 40%, whereas HIKVISION witnessed a decline of around 59% in CY Q2 2013 as opposed to CY Q1 2013. 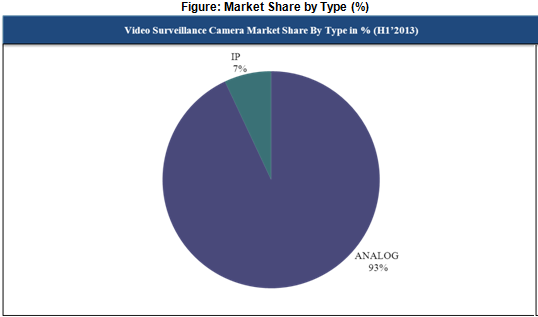 The market share for analog based Video Surveillance Cameras exhibited a decrease of 6% as compared to the previous quarter. For H1’2013, the analog based cameras account for more 93%, whereas dome shaped VSC’s amount for more than 65% of the total market share. 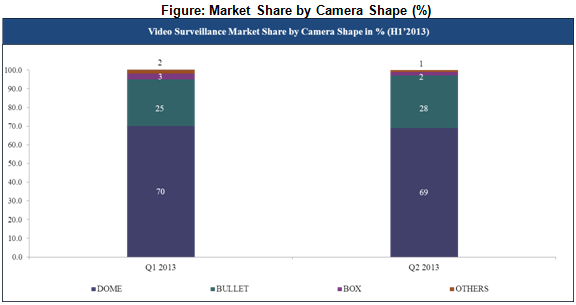 Source: 6Wresearch Quarterly India Video Surveillance Market, CY Q2 2013. As many as 200 vendors shipped VSC’s. Top 3 players collectively account for more than 44% of the total market share. More than 65% of total units shipped are dome shaped. Note: Others Include Cube, Ceiling, Standing and Mount shape cameras. Dome shaped VSC’s dominate the H1’ 2013 accounting for more than 65% of the market share followed by bullet and box shaped VSC cameras. PTZ featured Video Surveillance Camera systems have experienced a significant decline of around 82%, where as Video Surveillance Camera systems with memory card support have exhibited a considerable decrease of around 70% for the current quarter. However, the video analytics featured VSC’s have witnessed a substantial decline in CY Q2 2013 as compared to CY Q1 2013.